A South African artist has defended his controversial work which depicts anti-apartheid leader Nelson Mandela doing a Nazi salute. Ayanda Mabulu's piece drew criticism after it was briefly displayed at a Johannesburg art-fair. A former president, Mr Mandela is a much-loved figure in South Africa, credited with ending white-minority rule. Mabulu said that he was speaking on behalf of poor black South Africans. "Mandela failed to deliver the dream and that makes him an equivalent of Hitler," he told the BBC. 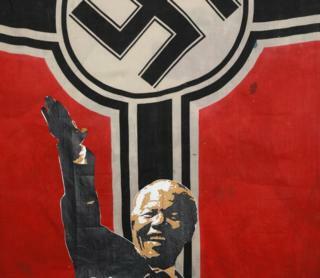 The piece, showing Mr Mandela superimposed on a German Nazi flag, was reportedly taken down at the FNB Joburg Art Fair as it was deemed insensitive. According to local media, Mabulu caught the event's organisers off-guard as he was not set to showcase his work at the fair. The Nelson Mandela Foundation, which was set up to continue the legacy of Mr Mandela following his tenure as South Africa's first black president, called the work deeply offensive and said it tested the limits of the freedom of expression. But Mabulu was defiant: "I do not have anything to apologise for." Is Nelson Mandela a sacred cow? South Africans are divided over the latest work by controversial artist Ayanda Mabulu, which has prompted the Nelson Mandela Foundation to raise questions about freedom of expression. Mabulu said Mr Mandela failed the poor, but has his depiction of the anti-apartheid icon, who spent 27 years in prison for fighting minority rule, as a Nazi gone too far? It is not the first time the artist has taken aim at politicians. Previously his supporters defended his inflammatory piece depicting former President Jacob Zuma in a sexual act, saying artists should have the space to express their views - no matter how shocking. But even in death, Mr Mandela is held in high regard around the world. Yet in recent years, as millions of poor young South Africans struggle to realise their potential, many have been critical of his legacy. That being said, Mr Mandela was also known for not shying away from criticism. For those who knew that fact, the artwork has not only felt like an attack - it has felt malicious. Even with his shortcomings, Mr Mandela was a peacemaker and an anti-racism campaigner while Nazi leader Adolf Hilter was, well, a killer and a racial supremacist - and history should not be misinterpreted. Mabulu was equally unfazed by the possibility of the lawsuit, saying: "I'm as poor as my people; I've got nothing to lose. I know they'll win a lawsuit against me but they'll never silence me." Many on social media supported the foundation's stance on the matter.